Drools & jBPM: Develop complex jBPM processes all in Guvnor? Yes, you can! Develop complex jBPM processes all in Guvnor? Yes, you can! The above video showcasts some of the new jBPM web-based tooling support added to Drools Guvnor and the Oryx Designer used by jBPM to allow both business users and developers to create complex BPMN2.0 processes without depending on the traditional development environments. * jBPM Custom-workitem definition editor in Guvnor. * Oryx Designer ability to store processes to PNG and PDF formats. 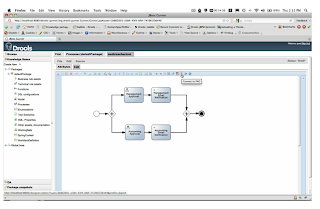 * Ability to view the BPMN2.0 source of the process in Guvnor. * Oryx Designer ability to generate process task forms which are fully-executable in jBPM Console. Templates also include form validation support out-of-the-box. * Tight integration between Oryx Designer and Drools Guvnor. In this video we create a simple medicine checkout procedure process which used both human tasks and a custom email notification workitem all in Guvnor, then execute it inside jBPM Console. video looks great! It would be nice to have a GUI tool in which you can do all your BPMN 2.0 stuff. Is there a way to access Human task processes via Java code? Somehow to connect to Guvnor process repository and see what processes are active, their names instead of to use Mina task? the jBPM console exposes a REST api you can use for different things. See chapter 11.4. REST interface of the jBPM5 docs. Also if you have the console running navigate to http://localhost:8080/gwt-console-server/rs/server/resources which will show you all the different things you can do. As far as Guvnor goes, you can use the Guvnor REST api to query all processes in your packages to get their sources. Other than that, Guvnor is not an execution environment for processes. Cool stuff. Thanks for the video! Thank you Tihimir for the help. JBoss AS 7 is out. What would be necessary to start Guvnor on this AS? Has anyone try it? @Kresmir I tried running Guvnor 5.2 on AS 7 beta 2, but it failed because of an unimplemented, unused ejb.timer feature (which is related to guvnor's misuse of seam 2). On AS 7 final it should run, but I haven't tried yet. Although there are no negative reports yet. For Guvnor 5.3, I am upgrading guvnor to seam 3 / weld, fixing the misuse of seam 2 and making sure it runs on AS 7 final too (because AS 7 rocks! - it's startup times is a giant step forward on anything else out there). I'm glad that someone is working on it. I would really like to try it on JBoss AS 7. They say it is much better then previous JBoss versions. When do you plan to finish and will you post where Guvnor 5.3 can be downloaded? Your demonstration was great, but I can't find the button to generate forms and publish everything to jBPM. I've download the jbpm-5.1.0.Final-installer-full from jboss site and I can't follow your demonstration on it. Is this a new version of Oryx or Guvnor not yet released? The Oryx Designer version used in the video is the latest 1.0.0.053 which you can get from sourceforge: http://sourceforge.net/projects/jbpm/files/designer/designer-1.0.0.053/. The Guvnor Workitem Definition Editor is currently only in master on github: https://github.com/droolsjbpm/guvnor. You would have to clone it and build it yourself, check build instruction info here: https://github.com/droolsjbpm/droolsjbpm-build-bootstrap/blob/master/README.md. Hope this helps. Thanks. I can't get how the e-mail notification works. In any moment you define how it would send the e-mail. What are the options to integrate such business process with my camel route, when camel sends the event to the process? Can you point me out to some examples, please? Can I deploy my camel application on JBoss? Can I deploy drools and Guvnor as OSGi bundles on Fuse ESB (Apache Service Mix)? Or it is better to run my Camel on Service Mix and Guvnor on JBoss like its suggested here: http://www.plugtree.com/drools-5-cep-case-study/ ? What modules should I have installed to create and run the BPMN 2.0 application? And what versions of those modules are stable enough? I am unable to find drools-guvnor.war anywhere? how should I proceed?